Pacific Boychoir Academy offers a full and challenging academic program in grades 4 through 8 that motivates boys to succeed. So often at this age, boys become disaffected from education, and decide that learning does not interest them; they begin to fall behind, losing out on vital preparation for high school. At PBA, we build on the boys' love of music and their achievements in performance to help in the classroom: they know the feeling of success, and learn to use this knowledge to excel academically. Our curriculum also offers varied approaches to learning, combining traditional classroom structures with hands-on projects, group work, creative activities, and theatrical displays to provide a stimulating environment appropriate to the strengths and needs of young boys. In the fourth grade classroom, we approach learning with enthusiasm and engagement. The small class size allows for an exceptional level of attention and interaction between teacher and students, with the freedom to build, explore, and expand knowledge and understanding. In Reader’s Workshop, boys engage daily with books to improve fluency, comprehension, and broaden reading interests. Through the Writer’s Workshop cycle, boys practice editing and revising their work, with an eye for proper grammar, clear descriptive writing, and developing final published pieces. Boys complete 4th grade with a sizeable portfolio of written work. In Math, boys learn mathematical processes in stages—using concrete representations, then pictures, and finally abstract numbers— and develop the strong foundational understanding of operations and critical thinking skills that will carry them through middle-school algebra and beyond. The guiding theme of Humans and their Impact on the Earth and Each Other connects the various areas of study in the 4th grade curriculum, and allows the frequent intertwining of California History, Life and Earth Sciences, Social Justice, and Environmentalism. Gardening, field trips, hands-on science, and service-learning opportunities create meaningful learning experiences for the boys. Our small group creates a dedicated and meaningful community of learners. We take care of each other and support each other through the exciting journey that is 4th grade at PBA. Fifth grade is an important year at PBA. 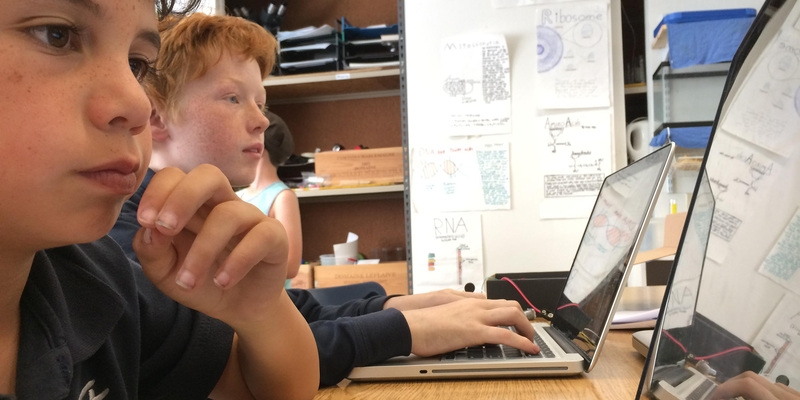 Boys work as a team to master increasingly challenging and complex academic topics while also learning to become more self-reliant students in preparation for middle school. It is crucial for students to have a home base as they grow into more independent citizens of the community, so fifth graders at PBA are members of a homeroom class in which they learn English, history, math, and study skills. Because these subjects are taught in the homeroom setting, there are many opportunities to integrate concepts across curricula. Writing skills are developed gradually over the course of the year, beginning with sentence types and structure, moving into paragraphs and letters, and finishing the year with interest-based expository essays. Typing and computer skills are introduced and reinforced during a weekly class with the school’s laptop computer lab. Math concepts are reinforced with hands-on activities and self-correction of homework assignments. Memorization-based concepts are presented and reviewed with songs and games. Organization and study skills are demonstrated and practiced as parts of daily class procedures. History and English concepts are assessed in a variety of ways. Fourth- and fifth-grade English focus on developing basic reading and writing skills. Students expand vocabulary, gain familiarity with grammatical structures, and put their knowledge into practice through frequent writing exercises (including a weekly creative writing workshop). Reading stories and novels improves students' comprehension; frequent class discussion encourages boys to acquire confidence in expressing their ideas orally. Sixth-, seventh-, and eighth-grade English build on this strong set of fundamental skills to produce highly literate, articulate, and thoughtful young men well prepared for the demands of high school. Frequent in-class writing exercises combine with a variety of writing assignments (stories, letters, alternative endings, discursive essays, research papers) to help boys grow into confident and purposeful writers. Constant discussion and debate teach the boys to develop and defend opinions through logical argumentation. Performing a Shakespeare play each spring is a middle school tradition at PBA's Day School. This year's production of The Tempest will be performed on Friday, May 11 at 7:00 pm and on Saturday, May 12 at 2:00 pm in the PBA Theatre. This production showcases the acting and technical skills of the entire middle school, including 8th grader Zachary Cohen as Prospero, 6th grader Noah Glickman as Ariel, 7th grader Charlie Baker-Armenta as Miranda, and 8th grader Isaac Jones as Caliban. In addition, the show features original music composed by faculty member Steven Blum and dance sequences choreographed by PBA parent Lissa Resnick of the No Strings Attached Dance Company. This play is the product of months of hard work and creativity on the part of our day school students, and we hope to see a wide cross-section of our community there! At PBA, History comes to life in a variety of ways, as our curriculum encourages an active engagement with the past, and with the diverse cultural heritages that compose our present. In fourth grade, students are introduced to the history of California. They even relive the gold rush by panning for gold themselves. In fifth grade, boys study the early history of America, from pre-Columbian times through the American Revolution. They hold a Continental Congress and discover the branches of government through a playground game. Sixth-grade History focuses on ancient cultures, beginning in Mesopotamia and ending in Rome. In seventh grade, beginning with the fall of Rome, boys are introduced to medieval cultures in Europe, Africa, and Asia. Boys deepen their knowledge of ancient and medieval cultures by planning an elaborate Culture Fair, in which they share their expertise with parents and fellow students through skits, songs, oral presentations, artwork, and food. Eighth-grade boys pursue and in-depth study of the principles of American democracy, and the various tests of those principles—the Industrial Revolution, the Civil War, the suffrage movement, the labor movement, the Civil Rights movement, the women's movement—from the nineteenth century to the present. Eighth graders put their knowledge of the Constitution to work in frequent debates on contemporary politics, including foreign, domestic, agricultural, and environmental policies. In the fourth, fifth, and sixth grades, students develop the foundational skills of logical reasoning, arithmetic, and problem visualization through the use of simple diagrams. The curriculum in these grades is Singapore Math, one of the finest in the world, designed to develop deep conceptual understanding and mastery without resorting to rote memorization or "drill." This provides students with a strong base for the pre-algebra and algebra curricula of the seventh and eighth grades. In seventh grade, students begin a formal analysis of radicals, exponents, and polynomials, while retaining a firm hold on the concrete and the visual: they develop spatial sense through the study of shapes in two and three dimensions, use coordinate geometry to plot points and curves, and explore data with the help of probability theory and statistics. Eighth-grade math at PBA is equivalent to Algebra I, the first-year math course at most local high schools. Students study linear equations and inequalities, polynomials and their roots, factorization, parabolas, and the quadratic equation. Advanced students may cover additional units in geometry, trigonometry, and introductory calculus. The math curriculum emphasizes connections: between arithmetic, geometry, and algebra, between math and science, and between math and daily life. These connections help motivate students to explore new mathematical concepts and methods. Drawing a diagram representing the components of an equation illuminates the solution of the equation; studying microorganisms leads to an appreciation of scientific notation; crashing toy cars turns into an analysis of velocity and acceleration and hence also of quadratic functions. Choristers' lives are filled with math: buying souvenirs during international tours requires a grasp of unit conversion; music class makes daily use of fractions, cycles, and periodicity. PBA boys do not question the relevance of mathematics in their lives. On the contrary, they have a genuine appreciation of its power to make sense of their world. Learning mathematics is a group activity. Students gather data together, discuss the best ways to solve a problem, collectively correct homework, and give oral presentations of their work to their peers. At the same time, the flexibility of the curriculum allows individuals to flourish. If a student needs to review earlier concepts, he receives support. If a student can consistently work above grade level, he has the opportunity to do so. Fourth-grade science focuses on planting and maintaining a vegetable garden; specific topics in life science and ecology are grounded in direct experience and observation. Aspects of "Edible Education" are also incorporated as the boys learn to harvest and cook their vegetables. In 5th-Grade science, students get an exciting, hands-on introduction to the three main branches of science they will study in future years: Life Science, Physical Science, and Earth Science. The emphasis is on the scientific research process and analyzing how science is done. This promotes students' development in scientific thinking and questioning, and builds their fluency with content material. 6th-8th Grade science is taught as a hands-on, multi sensory experience that is integrated across curriculums, especially math. PBA’s science curriculum is built around sets of experiments developed by the Lawrence Hall of Science called Full Options Science Systems (FOSS) kits. Students build foam rollercoaster and mathematically analyze them. Then they redesign them to see if they can improve their efficiency and speed. Then we build a giant one in the theatre. Students explore the physics of toys and watch astronauts use them in space to see gravity's effects. Students build models of chemical compounds and use them to model their chemical reactions. Students analyze the human body organ system by doing experiments that demonstrate the science of how each organ works (example: air pressure and the lungs or solubility and absorption in the intestines). Students build seismographs and "earthquake" their desks. Instill in boys a respect and passion for the importance of international languages, helping them to become "citizens of the world"
PBA offers a distinct inspiration for the study of languages: our boys sing in many languages, and tour each summer to non-English speaking countries This presents a unique opportunity for cross-curricular learning. In addition, when we are traveling to a foreign country we make an effort to give the boys instruction in the language of that country. Spanish is taught by means of the Communicative Language Technique, in which an immersion classroom is the goal. Each class employs a variety of modalities—music, games, written practice, conversational modules, projects, and cultural exposure through audio-visual activities and art. Each class also centers on communication practice through individual, group, paired, and whole-class practice in the four foreign language skill areas: speaking, reading, listening, and writing. The cultures of various Spanish-speaking countries are examined by looking at art, music, history, and current events. Latin is frequently used in choral music. By studying Latin, we deepen each boy's appreciation of the music they learn, offering them a richer and broader musical experience. The Latin curriculum emphasizes both language and culture. Students develop mastery of the Latin language by studying vocabulary, grammar, and the fundamentals of translation. In the process, students gain a firm understanding of both Latin and English grammar. Many of our graduates start in second year Latin at high school. Physical Education at PBA seeks to engage all students in a positive learning atmosphere. Each grade has physical education three times per week for 40 minutes. One class per week is dedicated to fitness, sport, and game play, respectively. An individual’s work ethic, attitude, and sportsmanship are central to each component of the curriculum. Students complete fitness tests assessing endurance, speed, agility, and core strength. Tests are given at the beginning of each quarter, with focus on individual fitness and performance goals. Students will learn basic rules of sports such as soccer, basketball, volleyball, and team handball. Basic fundamental and tactical skills are taught and practiced through scrimmage play. In both fall and spring, students take part in a six-week swimming course, designed to teach the proper techniques of the four competitive strokes (freestyle, backstroke, butterfly, and breaststroke). Students have the opportunity to practice each stroke through various drills and relays. Popular physical education games such as dodgeball, tag, wall-ball, capture-the-flag, and kickball are also implemented throughout the year. PBA offers basketball as an after-school sport for Grades 6-8. The team plays other middle schools in the East Bay area. The season begins in January and continues through early March. Our Art program has been designed around a non-traditional approach to the process of art production. Our instructor has adopted Arthur Danto’s philosophy of ‘What is Art?’ which is, in essence: Art can be anything, as long as it is about something (hopefully relating to what it means to be human) and it’s construction embodies that meaning. Students will learn the fundamentals such as: the color spectrum (primary, complimentary, etc. ), proper watercolor techniques, shading and modeling, blending acrylic paints, perspective, three-dimensional sculpture, and more. However, these fundamentals will be embedded in lessons reinforcing an Art History lesson or enrichment for History, Science, Math, or English. In addition, we invite children to dream up outlandish projects. Whether it’s covering the art room in Yellow Post-It notes, or making a mural out of paper cups in the fence, as long as it is about something and the way it is built embodies that idea, the idea will be entertained. Giving students the freedom for unfettered creativity can spill over positively into other parts of their lives as well. To begin the year, the students decide what are their most important attributes and then create a symbol to represent those attributes. They will then use the symbol to sign all of their artwork for the year. In addition, the Art teacher will work with the music staff to help students understand the historical context of the music they are singing. For example, to understand the theatricality of Baroque music, the students will learn about architecture by Borromini and paintings by Caravaggio. By seeing examples of other artistic creations during the same period, the students may become enlightened about the motivations or inspirations of the composers, and make the music they are singing more personal. Based loosely on the RSCM training program, the PBA's theory program combines elements from piano teaching techniques, rhythmic teaching techniques from Karl Orff, pedagogical tools developed by Kodaly, vocal technique, ear training, and raw academic theory to develop complete, versatile, knowledgeable musicians and singers. The Pacific Boychoir's most accomplished singers can sightread as well as professional adult musicians, and know as much theory as second-year undergraduate music students. The PBA's vocal training mixes Bel Canto technique with intricate knowledge of boys voices, their registers and their needs. Ours is a "Continental" style boys choir, both in terms of voicing (boys, not adult men, sing alto), and tone (similar to choirs of Austria and Germany). By design and necessity, Pacific Boychoir music staff are experts in boys' changing voices, how to use them without hurting them. As the proverb that goes, "if you can speak, you can sing," we believe that anybody who can speak has notes they can use to sing. Training changing boys' voices means having a willingness to monitor constantly shifting voices, changing voice parts as needed, and picking individual notes or phrases to modify. This kind of care allows teenagers in the Pacific Boychoir to continue to sing throughout their high school years. Boys choirs have a great tradition in the history of music, and as part of this tradition the Pacific Boychoir often performs pieces written for boys voices by composers such as Mendelssohn, Bach, Mozart, Britten, and Rachmaninoff. To our knowledge, the Pacific Boychoir is the first boys choir (boy sopranos and boy altos) in America to perform works written for boys voices such as Bach's Cantata 150, Bach's Lutheran Masses, and Rachmaninoff's All-Night Vigil (Vespers). Since 2002 the Pacific Boychoir has performed often with the San Francisco Symphony. These concerts have included pieces by Mahler, Britten, Wagner, Orff, and Berlioz. In addition to these symphonic masterworks from different countries, the Pacific Boychoir learns dozens of folk songs every year from countries around the world.